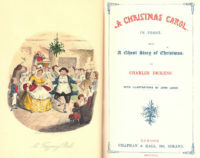 Charles Frederick Worth was born in 1825 in Bourne, England. He was the youngest of five children born to William and Ann Worth and only one of two children (he and his brother) who survived to adulthood. His father abandoned the family by the time Charles was 11, leaving them impoverished. Charles was sent to work in a printers shop. He moved to London one year later and became an apprentice at the Swan & Edgar department store in Piccadilly. Before the age of 20 he started working for Lewis & Allenby, thus setting the path he would follow the rest of his life. Not satisfied with life in London, Charles Worth, set off for Paris in 1846 . It didn’t matter that he had £5 in his pocket and couldn’t speak French. He became a sales assistant at Gagelin-Opligez & Cie, which sold silk fabrics to court dressmakers. They also sold cashmere shawls, a must-have accessory of the day, and ready made ladies’ mantles (cloaks – originally sleeveless). To complement the shawls, Worth started designing and sewing simple dresses. His tailoring talent garnered much attention among the store’s clientele. Soon, he was in charge of a newly created dress department. 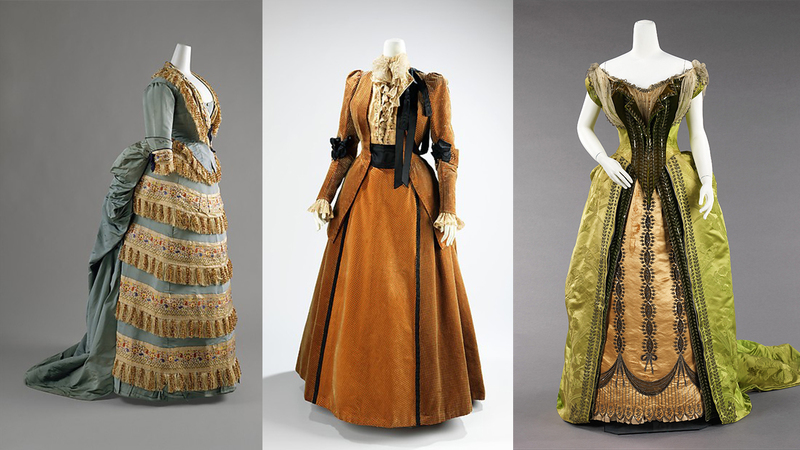 His prize-winning fashion designs were on display at the Great Exhibition of 1851 in London and the Exposition Universelle in Paris in 1855. With a well-known name and a business partner, Worth and Bobergh opened in 1858 at 7 rue de la Paix. Worth’s wife was also involved with the fashion house from the start. She was instrumental in selling as well as bringing in new customers. Within a few years he was designing for royalty as well as the wealthy. Worth forever changed fashion in many ways. He was the first to have his name on the label inside a garment. He changed the dynamic of the relationship between client and maker by creating a social meeting place where his well-heeled clientele would come to him for consultation. He also was the first to use live models to display his gowns. His wife was his first live mannequin and was described as the world’s first professional model. He is responsible for reining in the crinoline. He designed a more practical silhouette by narrowing the crinoline in the front and moving the largest part to the back. This allowed women freer movement. He eventually stopped using crinoline and created what has become know as the princess line; a straight gown without a defined waist. He also is responsible for raising the hemline to the ankle, which was shocking for its day. But, women loved his walking skirt, which was originally designed for Empress Eugénie (the only client not required to come to him for consultation). 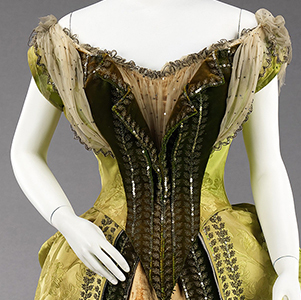 By the 1880s, the House of Worth was starting to resemble the modern couture house. He offered two seasonal collections every year. He allowed for the franchising of patterns and fashion plates. Charles Worth designed everything from evening wear to day wear and even tea and night gowns for a clientele that included other royalty, wealthy Americans, and popular actresses of the day such as Sarah Bernhardt, Lillie Langry, and Jerry Lind. The fashion house went through many changes starting in 1870, with the onset of the Prussian War. It was also affected by the financial downturn of the 1880s. But, the company survived and by the time of his death in 1895 at age 69, Worth’s sons, Gaston and Jean, had been involved in the company for more than 20 years. That didn’t mean that Charles wasn’t active presence, though. He was often seen at the fashion house up until his death. Even after his death, the House of Worth continued to innovate and create.